Limited space when remodeling our kitchen cabinets? | Rincomatic Blog. Limited space in the kitchen, a common reality. Limited space when remodeling your kitchen cabinets? It is very likely that on more than one occasion we have gone for a walk and encounter unexpectedly some kitchen studio or store. Large showrooms that showcase dream kitchens, impressive due to their modern and minimalist style, simplicity and, above all, large dimensions huge measurements. After observing a few minutes, the question arises: who really has such a space in the kitchen? It is true that unfortunately, most citizens have a rather small Surface that forces us to consider all posible alternatives to optimise to the máximum the space. How to improve corner cabinet access and storage in L-shape kitchens? 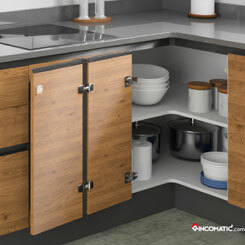 Being aware of the limited space, we face a new challenge: how to maximise your kitchen corner cabinet access and storage? There are many interior designers who make every effort to avoid corners in their designs, but it is not always possible to get rid of them. At this stage, it is time to choose the alternative which brings together the largest number of advantages and in turn, fits the priorities of the end user. Does exist a corner cabinet solution that meet everyone´s needs and styles? That is exactly the question we have been asking at Rincomatic since our first decorative corner cabinet solution was launched 24 years ago. 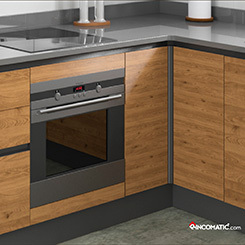 And it is not easy to face changing trends in the design of kitchen cabinetry, modern styles that are constantly being renewed and end users with a high level of information and more demanding every day. Our interest in satisfying clients, own experience and continued dedication have enabled us to evolve the original rincomatic hinge into three new decorative corner hinges models: “RincoPlus40“, “Compact32” and “RincoBasic40“, with two ways of accessing to the L-shaped corners: independent doors and united or combined doors. 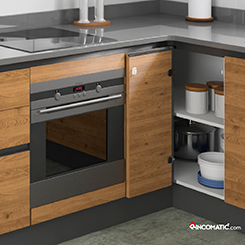 With these solutions, kitchen corner units have become into a space fully accesible and usable for a better storage, with two access options and a sterling and customizable corner finishing. Our commitment is to continue innovating these solutions, trying to meet these and other questions and needs of our customers. We invite you to learn a little more about these kitchen corner solutions in order to discover which is more suitable to your designs.